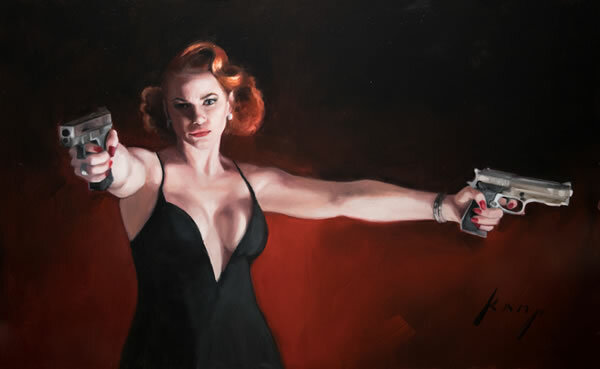 For his latest solo exhibition at Clarendon Fine Art on Thurs 8 Nov, artist Vincent Kamp is turning Mayfair’s Clarendon Fine Art Gallery into a den of iniquity, together with gambling geezers, tattooed mobsters and gun totting barmaids. Made up of thirty new paintings and featuring a cast of twenty characters, The Long Game tells the story of a high stakes poker game that ends badly. For one night only, the cast will be present, alongside ‘the narrator’, re-enacting the story to create a unique interactive experience for the viewer. Acknowledged as one of the most evocative and exciting new figurative artists working in Britain today, Vincent Kamp is fascinated by the underground world of urban subculture and crime noir filmmaking. His paintings delve beneath the surface of social class, creating intense portraits of people in a fused background of cinematic lighting, brooding tension and impending drama. Heavily influenced by films and TV, particularly the crime and gangster genres, Vincent Kamp has learnt as much about composition and lighting from cinematographers as he has from the old masters. His arresting and mesmerising portraits always evoke emotion and intrigue about the backstory and future of the characters. The Long Game opens at Clarendon Fine Art, 46 Dover St, W!S 4FF, on Thurs 8 Nov (private view) and will run until 24 Nov.
Kamp was voted Artist of the Year 2017 by Talented Art Fair.